Do i have seborrheic dermatitis? My forehead has always been the clearest part of my face. Nice, smooth, evenly toned skin. Then about 2 months ago, i noticed a few small bumps on the forehead. They were all around the area between the eyebrows except just a little higher. No place else. They were very small. I go to the dermatologist and he takes a quick look and says its seborrheic dermatitis. As November comes and goes, the bumps have taken a life of their own. Now its from the eyebrows to the hairline area. The bumps never reach acne size but stay very small. Sometimes i can see very small pin sized needle whiteheads but not many. The symptoms are usually just itchy, not all the time, and redness. Does it flake? Not really. Only time it flakes is when i finish washing with either H&S, Selsun Blue, or Ketoconazole 2% (which was prescribed by my derm). Sometimes i apply the shampoo to the area which is when the flaking happens and i'm guessing the formula is just too drying on the skin. Other times when i wash my forehead with Cetaphil Gentle Skin Cleanser, i can't really say i see any flakes. There's no crusting either. The redness is scattered around the bumps so my whole forehead isn't red. There are still areas on the forehead which look fine. I noticed the itching is primarily right above the eyebrows with a few around the middle of the forehead. I noticed when this started, my scalp has become more itchy as well. This was never the case in the past. Another thing i've noticed is that it comes and goes, which is why i don't think it is acne. Sometimes it can be red, while other times it can be more tame where it will take the perfect angle/light/distance to see the problem. There seems to be patches. Sliding your fingers across the forehead will reveal the uneven skin texture. Maybe scaly? Definitely not dry as i do have an oily face. Does this sound like Seborrheic Dermatitis to you? What do you think it is? Sorry for the lousy pic, but here it is. It very much sounds like SD or seborrhea dermatitis. I have it also and it flares more in the Winter when it's colder. My forehead gets a bit scaley and has little pin-dot bumps or thingys too. The Spring/Summer it's mild as this time of year more moisture is in the air and it's sunny. The sun is good for our skins in mild amounts. My Derm. also prescribed Nizoral shampoo for my scalp, which I use twice a week. I use either the Nizoral shampoo mixed with my gentle face cleanser a few times a week and that helps my face. The SD is mainly on my forehead though I have a tad on the outer sides of my nose. Another thing I have is Nizoral foam (called Extina) this is good also. It's a quick absorbing foamy mouse you apply to your face once/twice daily. I use this once daily on my forehead if it needs it (and not use the shampoo). Another thing you may wish to try is getting another cleanser than Cetaphil. Cetaphil is touted as gentle, however, it contains Sodium Laureth/Lauryl sulfate in it which is a harsh ingredient (ie. 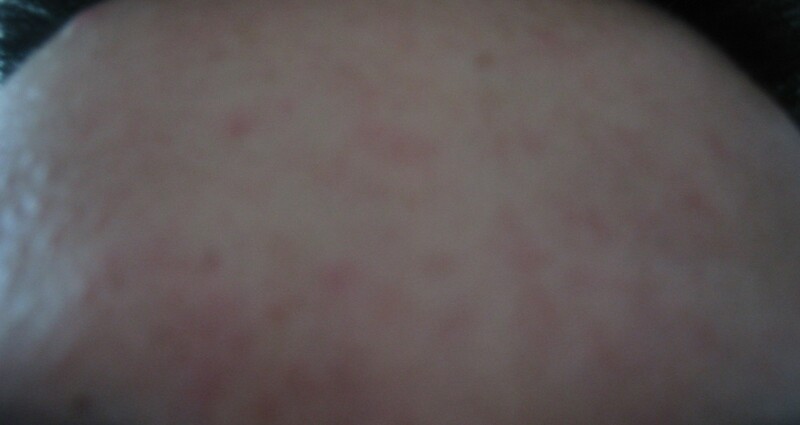 drying and can cause irritation/rash-like bumps in some people). Try something better, without sulfates. When I switched years ago, to non-sulfate products, it made a big difference in my skin. Free and Clear, Skin Medica, Fresh, and many other brands make sulfate free cleansers. Lastly, eating a good diet (lots of fruits and veggies) and taking probiotics can help too. SD is triggered by a yeast (melazzia) meaning there is an abundance of yeast on our skin and/or in our body. Seborrheic dermatitis is the medical term for "Cradle Cap" most often occuring in babies. It is quite unusual to occur in adults, but when it does it would usually occur in ages 30+ and most often males. This particular skin disorder will start as what one would describe as "Dandruff". It is a fungus and not an acne related condition. There are several steroid creams that you can use or certain dandruff shampoos. The most effective would be Neutrogena T/Gel. If that doesn't help, try to find a shampoo that has "Tar" in it. This will kill the fungus that is causing the problems you're experiencing. I looked at your picture as best I could and It was quite hard to tell for sure if this is what you are suffering from because this condition causes very dry itchy scales and the skin tends to sloff away. I hope you'll try my suggestions, if you do not get any results from those, then it is not SD that you are suffering from. Also I'd like to add.....use the T/Gel are Tar containing shampoo anywhere that you are having problems, as like I said it is a Fungal condition and that fungi has to be killed to rid you of that problem. Good Luck, and I hope this has helped you! You may want to check this board and the internet, seborrhea dermatitis is not uncommon in adults at all. It occurs from an abundance of yeast, and is un-curable but manageable. If you have itchy and scaley skin (sometimes with bumps or pin dot plugs) it's probably SD. There are many remedies to keep it at bay, the worst time for SD to flare is often colder Winter weather.